A FoodWIse Strong Bodies class celebrates at the end of a fitness session. 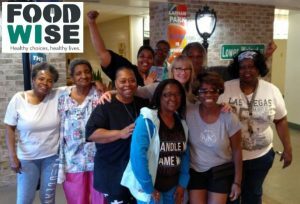 This fall the FoodWIse Nutrition Education Program began to lead a new program called StrongBodies. This moderate-intensity progressive exercise program includes strength and balance training. The program is designed to improve muscle strength, dynamic balance, and flexibility in older adults. Nutrition education is also included at the end of each bi-weekly lesson. FoodWIse Educators Denise Clark and Oscar Hernandez led programming at Brewery Point Apartments, Clinton Rose Senior Center, Indian Council of the Elderly, Lapham Park, and Wilson Park Senior Center. After eight weeks of exercise, participants strength and flexibility improved in fitness testing. “All of the residents that participated can’t get enough of this class! 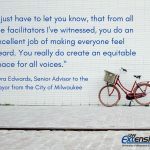 I have heard lots of stories about how building strength has prevented falls,” said one Program Partner. 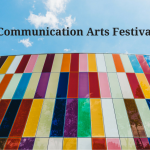 The 2018 Communication Arts Festival is just around the corner. Learn more about how 4-H members can enter their posters, photography, creative writing, and more!